Replace the damaged or outdated floors in your bathroom and kitchen with our stylish tile flooring options. Our flooring store boasts a brilliant selection of porcelain, ceramic, and slate tile flooring in a variety of different styles. We have the top brands from Emser, Interceramic, and Marrazzi. Our tile selections are extremely durable and easy to care for. With just a little bit of regular cleaning, you can expect your tile floors to last a very long time. Our tile floors are the perfect choice for those that want to get luxurious, long-lasting flooring at an affordable price. 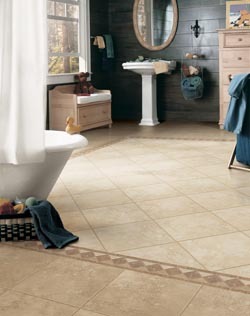 We offer the best value on tile floors starting at $3.99 per square foot. A major benefit of decorating your home or business with tile flooring is that it takes minimal maintenance to keep it clean. Right now, you can get $100 off any flooring purchase. We also provide special financing options and free estimates on all flooring installations. Upgrade the value of any home or business with a new tile floor. Porcelain is a high-end flooring material that is popular in many homes because of its numerous beneficial properties. One of the biggest advantages of porcelain tile is its strength and density. This strength means it can endure extremely heavy pressure, and the density makes it exceptionally resistant to moisture absorption. During the manufacturing process, the material used to make porcelain is fired at exceedingly high temperatures. This makes the porcelain completely non-porous, which is why it is so hard and dense. The process is also what gives it a translucent, almost pearl-like appearance that many homeowners find so appealing. All of these properties are what makes porcelain tile suitable for both casual and formal settings in residential and commercial structures. You can create endless designs throughout your home or business with perfectly-matched, decorative accents and trim pieces. Check out our selection of porcelain tiles and let us know if you need help deciding on the floors that best suit your needs in looks, performance, and price. Adding this tile flooring will instantly increase the value of your home and give it a modern look and feel. Expect to receive endless compliments from anyone who sees your stunning new porcelain floors. With creative designs, long-wearing durability, moisture resistance, and ease of maintenance, ceramic tile is the ideal flooring choice when you want beauty and durability. This flooring is one of the most popular choices for kitchens and bathrooms for a number of reasons. Not only is this flooring option aesthetically pleasing, it is also extremely resilient and easy to maintain. If you include grout with your new tile floors, which we are happy to install for you, it becomes completely resistant to water damage. The versatility of ceramic tile is another advantageous feature. You can put it in any room in your home and it will look and function beautifully. From obvious places like kitchens and bathrooms to areas you may not have considered, such as the living room or hallway, these floors add style and elegance. The reason it is suitable for any room in your home is because of the design flexibility it offers. You have virtually unlimited choices when it comes to the color, pattern, and texture of your tiling purchase. You can opt for traditional white that goes well with every interior style, or something more exotic to create a Mediterranean theme for your bathroom design. Regardless of the style you choose, you can expect to get a great deal with our affordable prices on this flooring. Adding ceramic tiling is one of the most cost-effective ways to give your home a fresh, new look. Because it is a bit softer than porcelain, ceramic works better inside rather than outside your structure. Create flooring that's a work of art by decorating your home or business with slate tile. This distinctive type of natural stone tile is characterized by its rainbow of earth-tone colors. Each separate tile literally looks different from another one. Any floor or wall will look better if it's covered with stunning slate. In fact, it can be used in both commercial and residential applications. In your home, slate adds beauty and functionality to the kitchen and bathroom. It will last long when used in various high-traffic areas of commercial buildings such as pool decks and entryways. Additionally, slate's dense composition makes it waterproof, so you can feel comfortable using it to decorate indoors and outdoors. Maintenance is always a consideration when you're considering adding tile to your home or business décor. You won't have to do much to preserve the appearance of your slate tile. Its natural characteristics help it repel dirt and water, so it always looks great. If you ever decide to sell your property, the slate flooring will make your home or business more valuable. Make sure that your flooring looks flawless by leaving the tile flooring installation to us. We follow the traditional installation process, which results in quality workmanship. Before one tile is put down, we prepare the substrate. This is to ensure that the tile will be level and that it stays in place. To make sure the tile is in even rows, we lay out the pattern. Next, we cut the tile into the shapes needed to create the floor pattern you request. We start the actual installation process by applying the mastic and laying the tiles. During this part of the installation, we pay close attention to detail to avoid any mistakes that might mar your flooring. We complete the job by grouting the joints. Tile flooring installation can be very creative, so don’t feel limited to the basic grid of square tiles. Try a brick pattern for your tile floor, and create a look that's reminiscent of the flooring in a subway. Checkerboard is perhaps one of the most popular and timeless tile flooring patterns; and it can create a retro look for your home. Many customers like to complement their tile floors with a border. Creating a tile border is fairly simple for us to do, but it’s a great way to add an elegant touch to your tile flooring project. Contact us today with any questions about our tile flooring selection in Lansing, MI. We proudly serve the communities of Mason, Haslett, East Lansing, Holt, Okemos, Williamson and Haslett, Michigan.